A small theatre in the center of the village of Greenville in the town of Smithfield. A 1935 city directory lists it as showing “moving pictures”. Diamond Hall may have had alternate functions as well. Diamond Hall was listed in 1928 and 1935 R.I. State business directories. I was told by the editor of the local weekly that the hall, located at the corner of Putnam Avenue and Austin Avenue, was torn down, probably in the 1930s. I am promised additional information, perhaps a photo. As far as I can determine, Diamond Hall was the only indoor Smithfield venue for movies before the advent of the Apple Valley Cinemas in the 1960s. There was also the Route 44 Drive-In, which was around by the 1950s. According to additional information provided by Mr. Laurence J. Sasso, Jr., editor of The Observer, an area newspaper, and a February 13, 1997 article in that paper, Diamond Hall was located in Wilkinson Block, which contained Wilkinson’s Store and Diamond Hall, situated on the second floor. That upstairs hall received its name “Diamond” from a diamond shade in darker colored wood in the center of the floor. Over the decades of its existence Diamond Hall was used for stage plays, movies, and graduations, and, no doubt, for meetings, dances, and other social events. 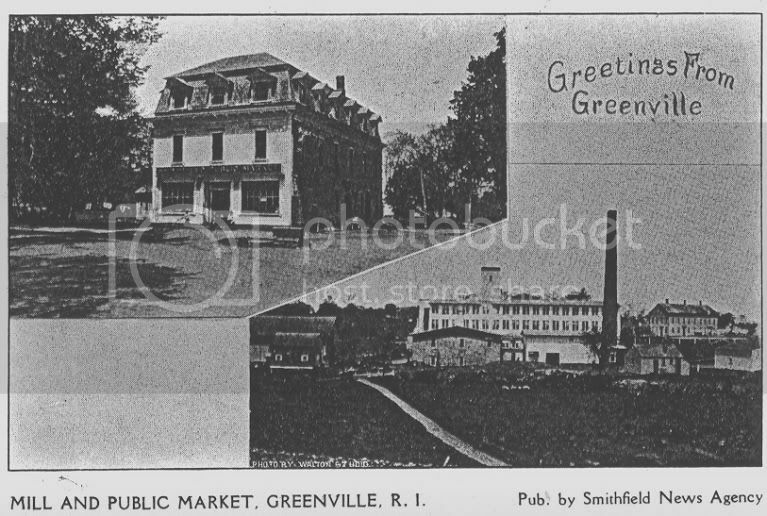 Greenville Grammar School was located diagonally across Austin Avenue. There was a fire in the 1930s, according to the recollections of many locals, and the building was torn down after that. It is not yet clear what year that was, and as I wrote above, the place is listed in a 1935 business directory as showing movies during that time. The spot where the building once was is now occupied by a cleaning establishment. The name of the place was also Wilkinson Hall, according to an October 11, 1913 program for a minstrel show, put on by a local group, “20th Century Minstrel Troup,” under the leadership of musical director Phil McConnell. Rhode Island had many such local halls built for a multitude of purposes and showing movies on either a regular or part-time basis. Others that come to mind are Myrtle Hall in Johnston, Peacedale Opera House in Peacedale, Music Hall in Pascoag. Here is an image of Diamond Hall (top) from a photocopy of an old postcard. The play A Sewing Circle at Mrs. Martins at Diamond Hall on June 3, 1925, per the Evening Tribune. The building look a bit French to me(i think? ).